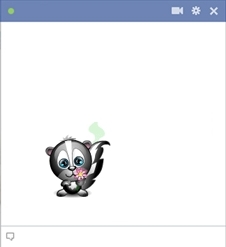 There are any number of reasons why it’s fun to send a little skunk like this one in your Facebook message. Perhaps you weren’t crazy about your friend’s last message and want to subtlety indicate that something smells! Maybe you just want to add this emoticon’s invariable cuteness to your messages!